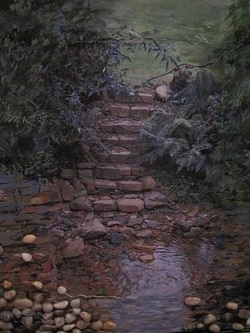 Learn how to transfer your favourite photos onto any porous surface using a transfer medium. Workshops include laser prints of photos & tuition. Great for beginners! BYO Hairdryer, A3 size hardboard, any special surfaces you’d like to transfer onto, acrylic paints & high resolution photographs on a USB stick or camera card (alternatively email them to me to save time during the workshop). BYO Hairdryer, A3 canvas or board, acrylic paints, paint brushes, rag, apron & high resolution photograph on a USB stick or camera card (alternatively email them to me to save time during the workshop). artwork on canvas using Transfer Medium, Fabric Hardener with other media. Book a 'play day' today!!! 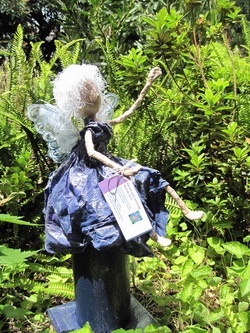 Make your own gorgeous faerie to grace your garden. This workshop includes all materials, faerie wings and choice of timber base to complete the faerie. A range of fabric is available including plains and pretty prints!! This workshop can be done on a canvas or polystyrene backing, or if you prefer a free-form, with trailing fabric and flowers. Choice of colour and fabric. You are welcome to also bring your own embellishments, but an extensive range is also available. This figure can either be a fisherman, elegant lady, culturally based figure or something abstract. Huge choice of fabric, trims, colour etc.Can be either for your garden or to decorate that special space in your home. Please note this is a plain faced sculpture. Another option is to complete the sculpture using Stone Art. The standing figure is based on the plain faced sculpture. It can be done in a size to suit you. 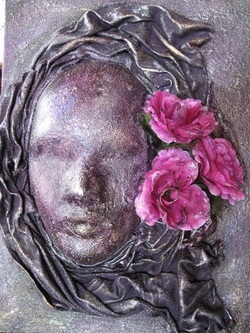 A range of fabric is available and the sculpture can be completed in any skin colour. Bases are concrete pavers, to provide stability if the sculpture is going to be placed in the garden. 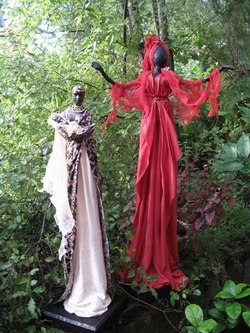 Join me for an afternoon learning how to make your own Faerie Bearie. Needle felted over a calico bear, all materials are supplied. Cost is $55 - $95 depending on the size of bear used as your base. If you don't finish the bear in the afternoon, the tools can be purchased from Faeries with Attitude, to complete your bear at home with a selection of fibres. This fun one day workshop will have you working over polystyrene eggs with a combination of Powertex and StoneArt. This is a great way to experience working with both of these Powertex products. Making the birds wings with air-dried clay, you will finish off the bird with a combination of fibres, fabric and a pair of "googly eyes". 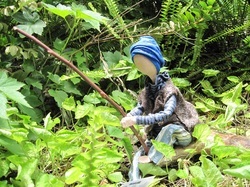 This two day workshop will see you sculpting your own faerie character face, hands and feet on Day One. Then, on Day Two, you will put it all together. Using a calico body as a base, I will take you through the process of constructing the doll and then embellishing it. You will be shown how to create your own flowers and beading is available to finish them off. A selection of fibre is available for hair in the colour of your choice. Cost for this workshop is $350, and it runs from 9.30 - 5.00. Clay and tools are provided. A materials list is provided for clothing and wings. Book a Workshop or CPT Course NOW! !